We purchased 2 black ottoman/footstools about 5 years back BK (before kids). They lasted us well, until we acquired a very playful kitten with very sharp claws, and a 2 year old who decided it would be fun to pick (okay, more like rip) the vinyl off the side of one of them, leaving a massive big tear. Not impressed. Anyway, what's a girl to do. Make over time!!! And here is a pic of what the ottoman looked like before, sporting the very unpleasant tear. 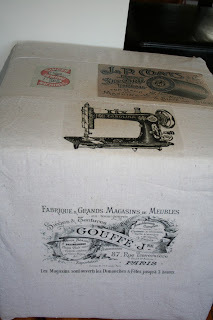 Then I printed some gorgeous transfers of vintage sewing advertisements and a sewing machine off The Graphics Fairy website and ironed them on. I saw some similar ottomans for $300! !